According to some surveys, 90 percent of all information in businesses today is retained on paper, even though the bulk of this printed paper is discarded after just one use. First developed in China in about the year A.D. 150, paper has many uses, the most common being for writing and printing upon. Indeed, the development and spread of civilization owe much to paper’s use as writing material. Such waste of paper (and ink cartridges) — not to mention the accompanying environmental problems such as deforestation and chemical pollution to air, water and land — could be curtailed if the paper were “rewritable,” that is, capable of being written on and erased multiple times. Chemists at the University of California, Riverside have now fabricated in the lab just such a rewritable paper, one that is based on the color switching property of commercial chemicals called redox dyes. The dye forms the imaging layer of the paper. Printing is achieved by using ultraviolet light to photobleach the dye, except the portions that constitute the text on the paper. 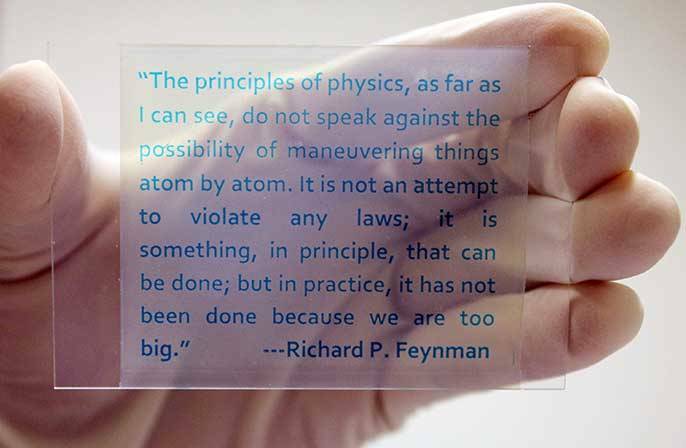 The new rewritable paper can be erased and written on more than 20 times with no significant loss in contrast or resolution.